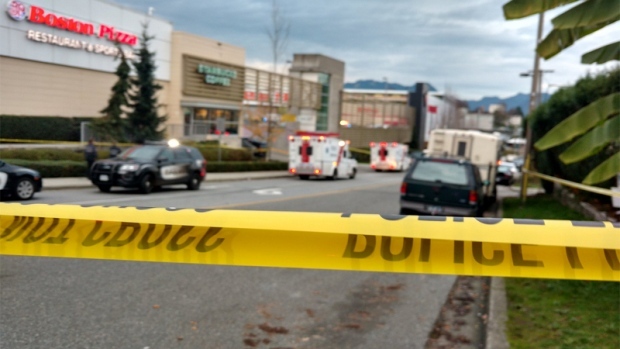 After a years-long investigation that suffered lengthy delays due to disagreements with police, the Independent Investigations Office has cleared the officers involved in a fatal shooting outside a Canadian Tire in East Vancouver. The police watchdog determined the three officers who opened fire on 38-year-old Daniel Peter Rintoul back in November 2016 were dealing with a potentially deadly threat, which justified their use of force. In a report on the shooting released Friday, the IIO said "all of the evidence supports the reasonableness and necessity of the decisions by (the officers) to shoot." Police were called to the Canadian Tire near Grandview and Rupert Street after Rintoul allegedly stabbed a clerk, opened the store's gun cabinets and began trying to remove firearms. He ended up abandoning the guns and walking out of the store carrying a knife and bear mace – both of which he allegedly used to attack police. Civilian witnesses told the IIO the officers shouted to Rintoul to drop his weapons and get down, but he began spraying the mace at them. Police then shot the suspect with a Taser, which sent him onto the ground, but only temporarily. Rintoul, who was a large man weighing about 430 lbs., proved too formidable to place in handcuffs. The IIO found he "very much outweighed the officers and they could not control even his arms." As they were trying to place him under arrest, the suspect began stabbing one of the officers, according to the IIO. That led to police firing one bullet and three non-lethal ARWEN rounds at Rintoul, but investigators said the suspect "was still intent on taking aggressive actions toward the police." Altogether, three officers eventually shot Rintoul nine times, ending his life. The IIO noted its report was delayed because of pushback from some Vancouver police, who refused to provide statements unless they were first allowed to watch third-party video the watchdog had collected of the incident. The IIO eventually had to file a petition in B.C. Supreme Court compelling officers to participate in interviews. The court sided with the watchdog, a ruling the IIO's chief civilian director Ron MacDonald called crucially important for the future of police oversight in the province. The Vancouver Police Union defended the officers' position, insisting they were only trying to be accurate, not unco-operative. "People don't recall accurately every little detail around what they did in any incident, let alone one that unfolds very dynamically and in a very stressful matter," union president Tom Stamatakis said back in 2017.